To give Daz Genesis 8 characters truly expressive facial animations, 63 x custom facial morphs have been created for optimal iClone Facial Mocap and Animation Editing. In the meantime, a brand new texture import pipeline has been introduced to greatly reduce effort when reassigning Daz character materials. We provide custom morphs and bone adjustments for Daz G3 and G8 characters so that their facial expressions can give better performances with iClone Facial Mocap and Face Puppet. 1. Login to the Register Product & Download Patch/Bonus page and download the updated iClone_Daz_Genesis_Extension_v4_IC7.zip. 2. The downloaded resources will include G1, G2, G3, and G8 expression data. This update is mainly for G3 and G8 male and female expression data. You can will see a folder, daz data file, and a text file inside the Genesis8_Male folder. 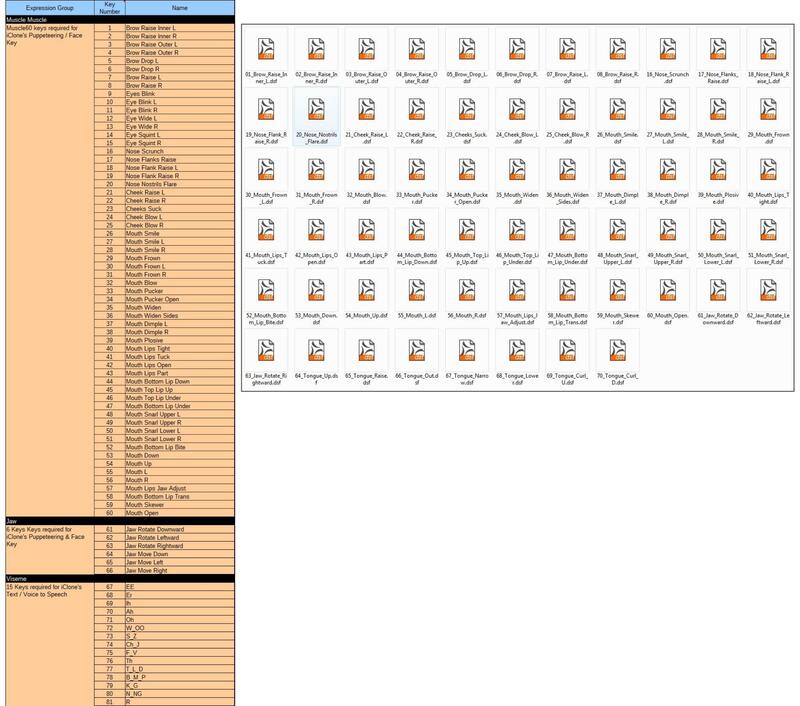 Reallusion folder contains 64 morph data sets in (*.dsf) format. 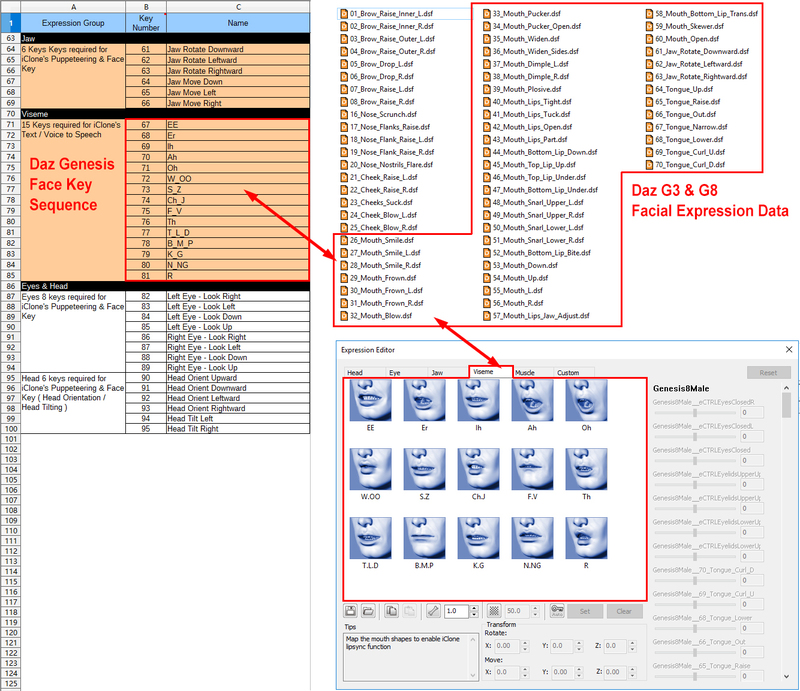 Genesis8_Male_iCloneFaceKey.duf contains the Daz face key sequences. How to use Genesis8 duf file.txt readme is also available for getting started immediately. 3. 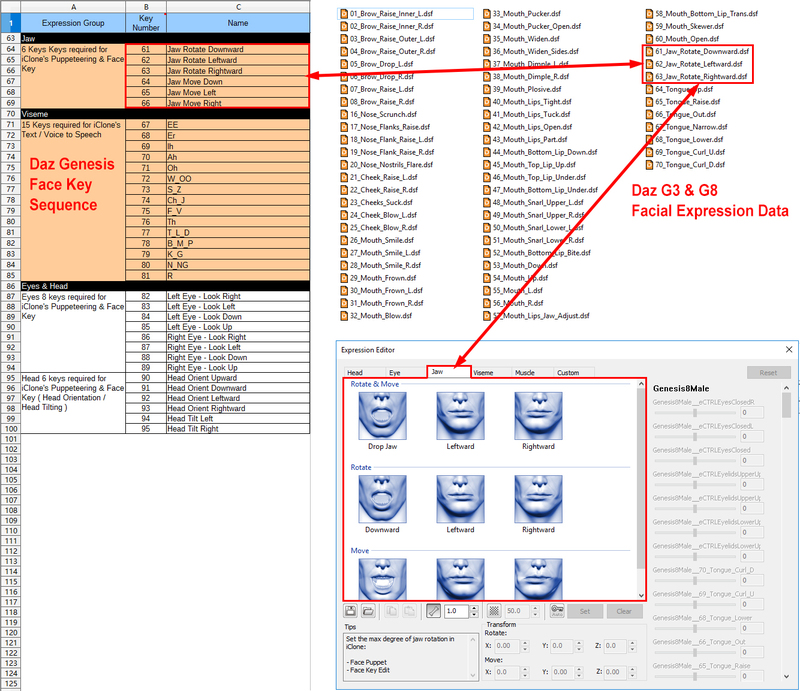 There are a total of 82 poses in the iClone expression system: Muscle x60, Jaw x6, Viseme x15. 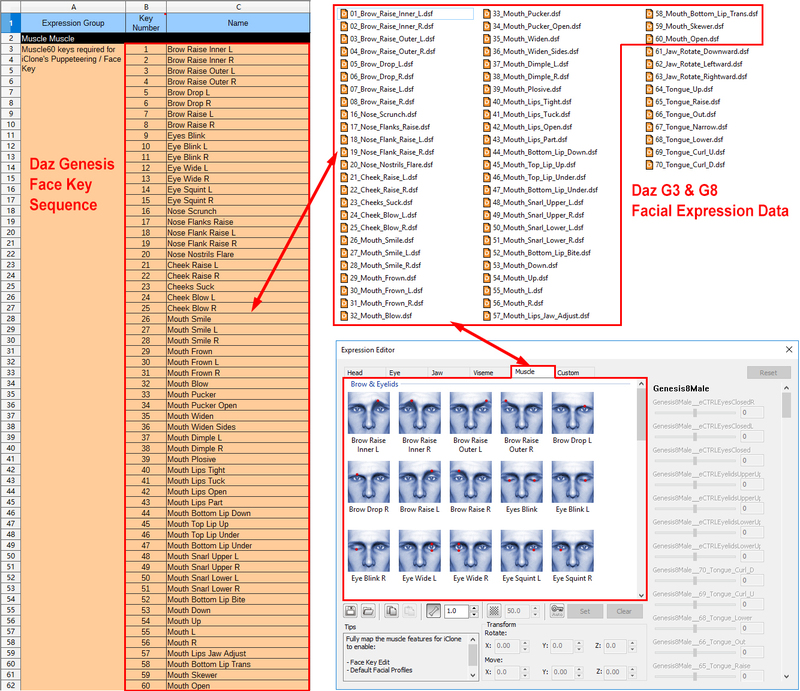 A total of 63 custom expressions are provided, mapping separately into the iClone expression system. Check the video for the detailed workflow. The following video will show you how to bring custom morph data into Daz and export a (*.fbx) into iClone via 3DXchange. Prior generation expression data relied on the default Daz morph set to create facial expressions in iClone. The custom expression morphs used on the face to the right are more compatible with iClone animation control systems. G3 and G8 expression data has received equal treatment for more detailed and expressive results with Facial Mocap. The new generation of facial expressions can better express the nuances of the Facial Mocap performance. The following video demonstrates the improved facial animation quality after 7.21 Facial Custom Morph for iClone is applied to Genesis 3 and 8 characters. The iClone-optimized material settings for Daz Genesis characters will now be applied automatically when using the Import FBX > Auto-convert to Non-standard Character workflow. A new pop-up message will appear when a Daz Genesis Character (*.fbx) is imported. 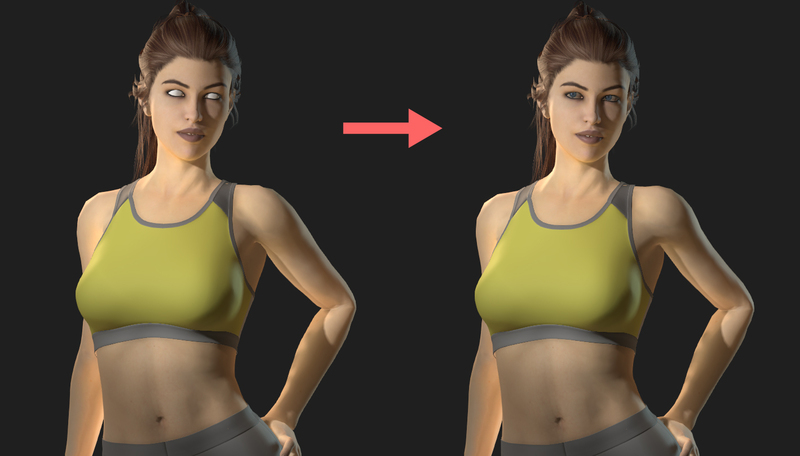 Before & After comparison: v7.2 vs v.7.21: 3DXchange auto-convert to non-standard character in iClone. If iClone-optimized material settings fail to apply, resort to manual assignment instead. Design concept: Exported Daz 3D characters in FBX format are not equipped with a complete set of textures for skin, oral cavity, fingers, and eyes. For example, the G3 and G8 default characters do not export with bump and specular maps. Some packs do not even export the normal map, needing additional steps to find the said texture. 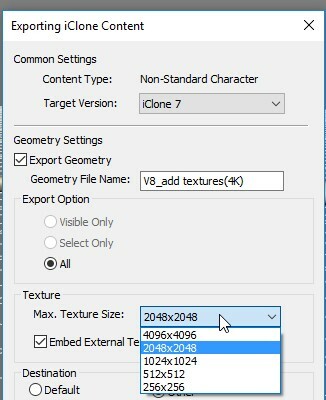 iClone 7.21's new Batch Load & Save Textures uses designated texture naming conventions to efficiently fulfill this need. 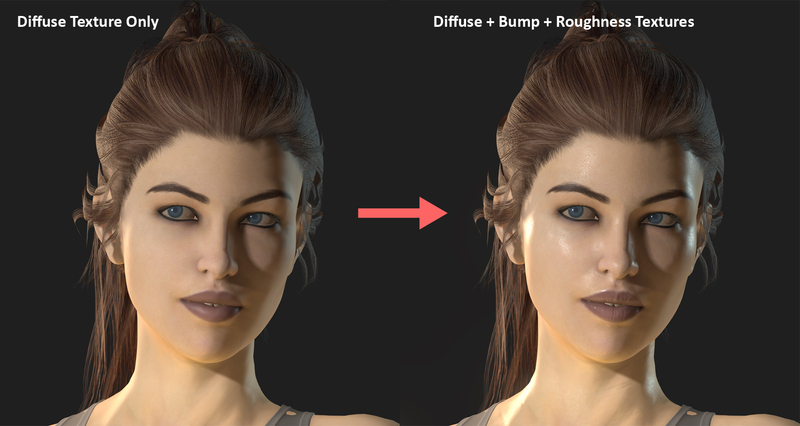 On the left, the character has only the diffuse texture taken from 3DXchange Convert to Non-standard function. On the right, the character is aptly supplied with the diffuse, specular, and bump textures taken from iClone 7.21 Batch Load Textures function. 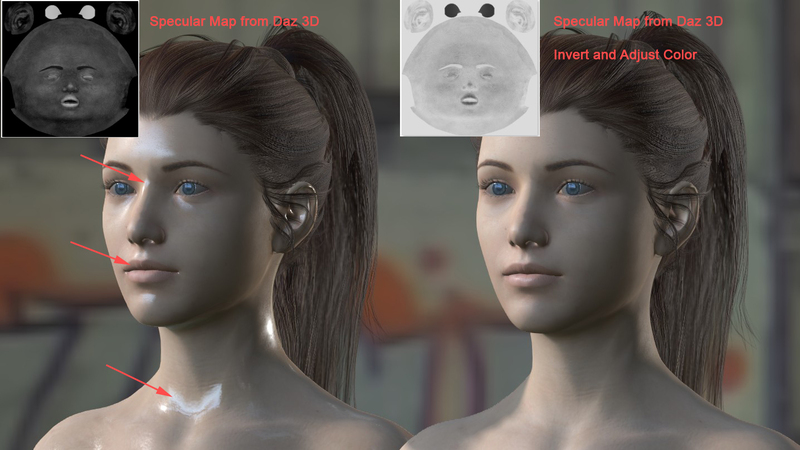 Step 1: Output the other missing textures such as the bump, glossiness, roughness, and specular maps from Daz3D. * Daz Genesis high detail textures can be as large as 4K. Shrinking this size first according to your needs will also make it faster to load the textures in iClone. * First examine the texture file formats. If the format is (*.tif) then save it in an iClone compatible format like (*.jpg) to make the entire process go faster. One 4k (*.tif) image is usually around 40 mb, which if not converted to another format can cause the loading time to hang and the final avatar size to increase substantially. Step 2: Classify the exported texture maps into separate folders. 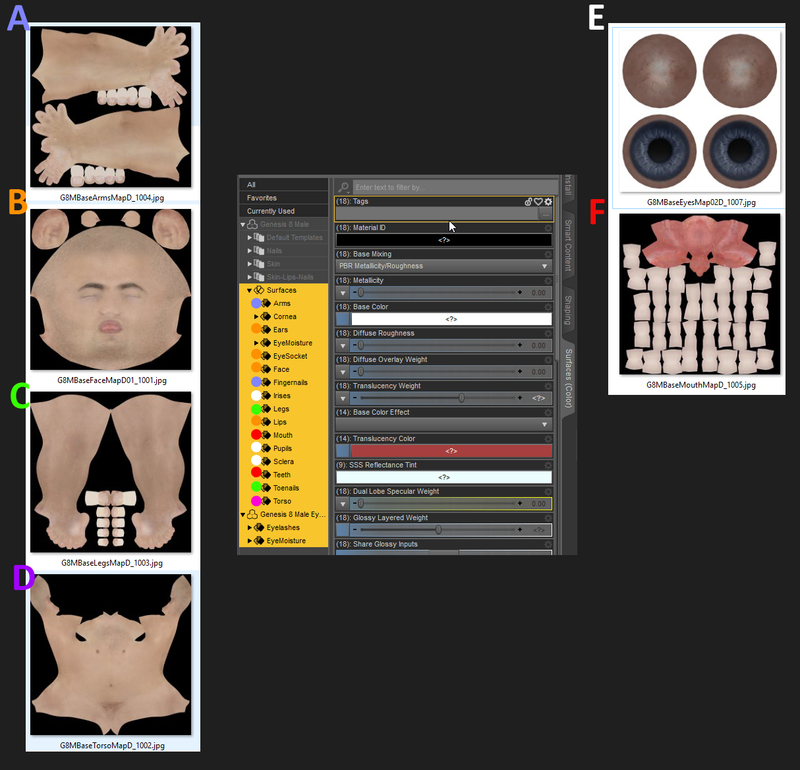 Take Genesis 8 as an example, one would classify the missing bump and specular maps into the "Arm", "Face", "Leg", "Torso," "Eye ball", and "Oral cavity" categories by using folders with corresponding names. 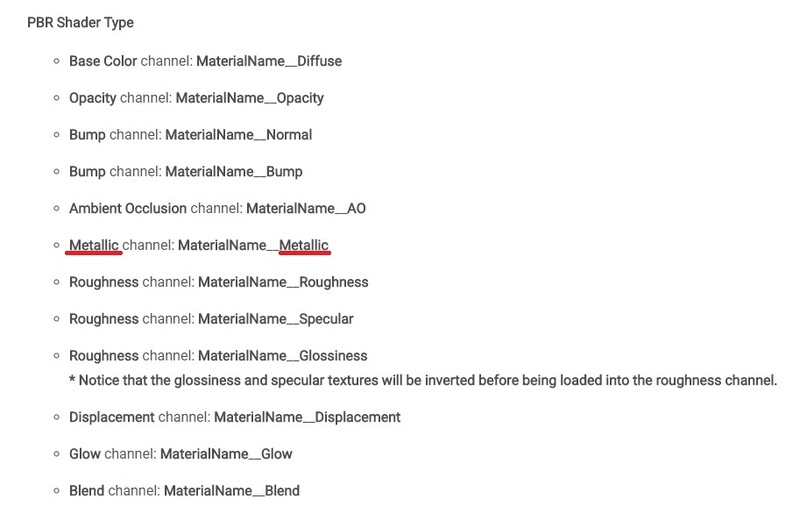 iClone applies special treatment to texture names with key Daz suffixes. Key Daz suffix 1 & 2: "TextureName__DazGlossiness" and "TextureName__DazSpecular" maps will be inverted with brightness decreased by 18% then applied to the roughness channel. On the left, the specular map is directly applied to the roughness channel with results that are incorrect. On the right, the specular map is first inverted then applied to the roughness channel with results that are more inline with expectations. 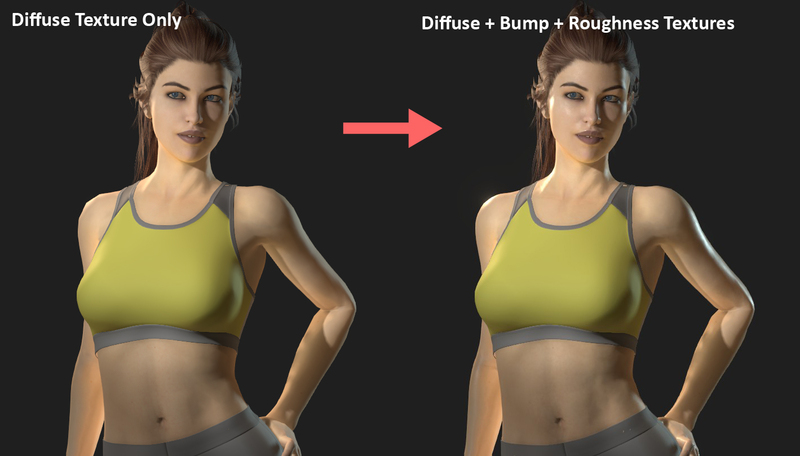 Key Daz Suffix 2: "TextureName__DazBump" maps will decrease brightness to 10% so to avoid excessive bumpiness. Key Daz Suffix 3: "TextureName__DazNormal" maps will not receive any special treatment. Therefore the suffix "__Normal" does not need to be changed as the handling method is the same. The aforementioned treatments can be edited under "\Program\Assets\Share\TextureImport\MaterialPresetConversion.ini". 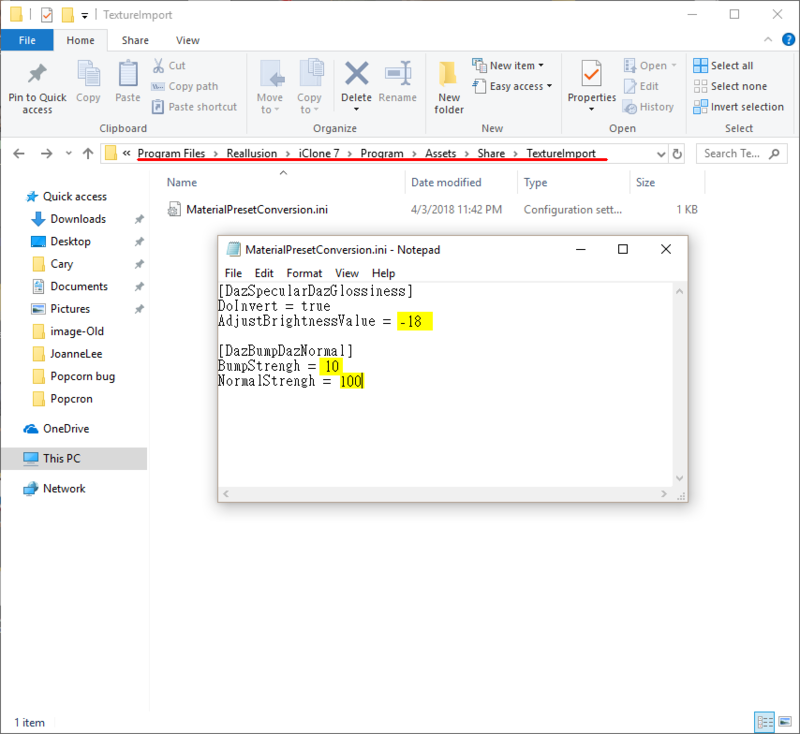 Step 4: Deploy the standard texture folder structure with iClone Save All Object Textures and assign Daz Genesis textures to the appropriate folder (see the illustration below). It is best practice to remove any unnecessary textures and folders to keep everything organized. A-"Arm" texture map: used for Arm and Fingernail materials. 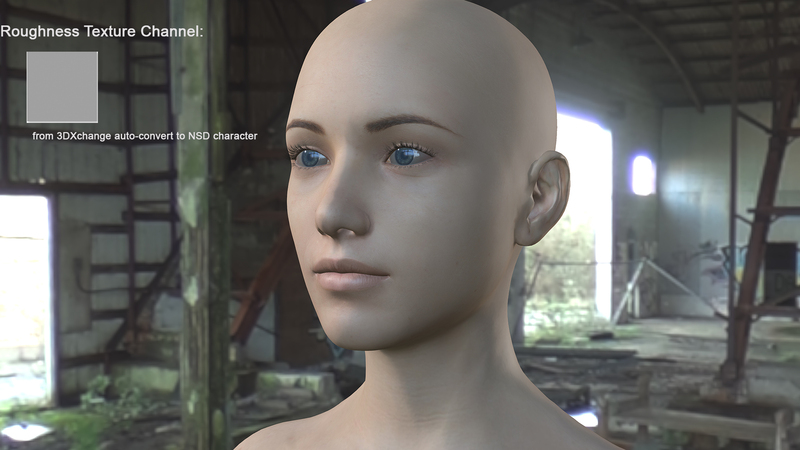 B-"Face" texture map: used for Ears, EyeSocket, Face, and Lips materials. C-"Leg" texture map: used for Legs and Tonnail materials. D-"Torso" texture map: used only for the Torso material. E-"Eyeball" texture map: used for Irises, Pupils, and Sclera materials. F-"Oral cavity" texture map: used for Mouth and Teeth materials. Step 5: Use Load All Object Textures and execute Auto-Link Texture, then finish by saving the iAvatar. I have no idea what I am looking at yet. THANK YOU RL FOR THIS WORK AND DEVELOPMENT!!!! Just to be clear here, Miranda -- is the Metallic texture REALLY renamed to be "Matellic"? (This per the manual). I realize English is a second language to your programmers, but this misnamed convention is going to cause a lot of confusion (because the channel itself in iClone is spelled correctly). Or is this just a typo in the manual? GenThanks x1000, Reallusion. These are problems that have seriously plagued me in the past few months. These features are EXACTLY what I needed. Edit: Aaaaaaand seems like I spoke too soon. I still can't get Gen 3 characters importing properly. Now it's not even auto characterizing the skeleton. Amazingly, 3DXchange has got worse for me. Where Can i find the new "expression data" file? In the "my account there is no updated daz Expression file to be found. Does any characterization UI pop up? If no, please help team to check this following file is still there? Please login to the Register Product & Download Patch/Bonus page again and click the Download. 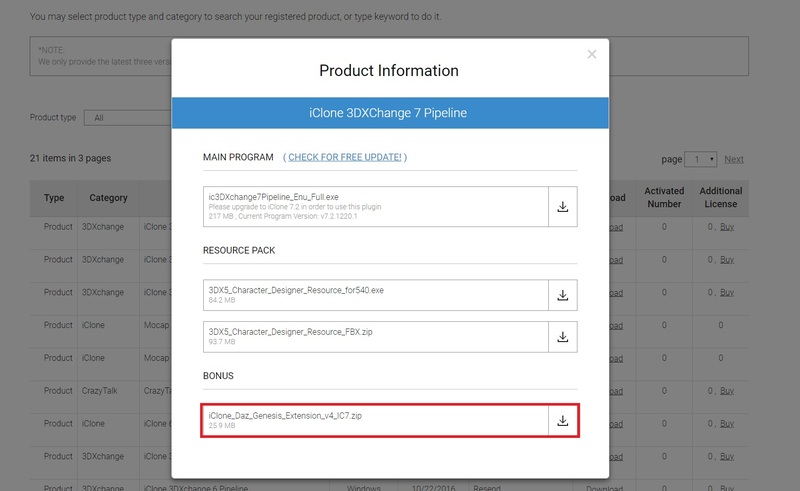 There should be iClone_Daz_Genesis_Extension_v4_IC7.zip under the Bonus section for you to get the latest version. Thank you for pointing out this mistake. We've corrected it in the manual.